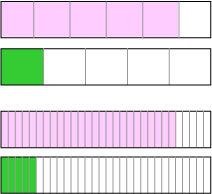 Subtract 5/6 - 1/5 using fraction strips. Subtract 6/5 - 2/3 using fraction strips. Subtract 7/8 - 1/4 using a number line. Subtract 7/5 - 3/5 using a number line. At a birthday party, Sandy ordered a chocolate cake and sliced it into 12 pieces. Beverley brought a lemon cake and sliced it into 16 pieces. Eight pieces of chocolate cake and 12 pieces of lemon cake were eaten. How much more lemon cake was eaten than chocolate cake? Select the correct answer for each question.